View the project page at Plaid here! 16008 - Gallery Glass ® Window Color™ - Kelly Green, 2 oz. 16012 - Gallery Glass ® Window Color™ - Royal Blue, 2 oz. 16014 - Gallery Glass ® Window Color™ - Amethyst, 2 oz. 16035 - Gallery Glass ® Window Color™ - Lime Green, 2 oz. 16425 - Gallery Glass ® Window Color™ - Citrus Yellow, 2 oz. 16455 - Gallery Glass ® Window Color™ - Sunflower, 2 oz. 16457 - Gallery Glass ® Window Color™ - Plum, 2 oz. 17053 - Gallery Glass ® Window Color™ - Jadeite Green, 2 oz. 1. Begin by prepping your surface by cleaning the mirror. 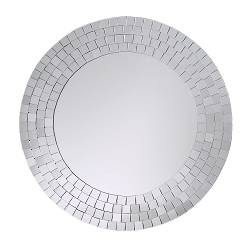 The mirror that I used in this project has small mirrors around the rim. If your mirror is flat, don’t worry it, you can use the same technique. 2. Working in a random pattern, paint each of the mirror tiles with a different color of gallery glass. 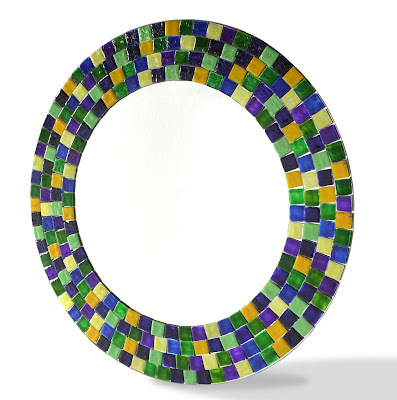 If you don’t have mirror tiles, just paint small squares around the rim. You will want to paint the squares for at least 3 or 4 rows around the rim. Allow the paint to dry for 36 hours. Tips: Never shake Gallery Glass! If you do you might get an air bubble. If you get an air bubble, just pop it with the end of a sewing pin. If you make a mistake, wait for it to dry and just peel the mistake away. This couldn't have come at a better time. Im literally doing my face right now so I can head to Orlando and get some craft room organization peices from IKEA. Awesome...because today is my best friends BDay, too.